When you learn new things, theory can give you the necessary background, but how do you really know what's where? The majority of people think in pictures. 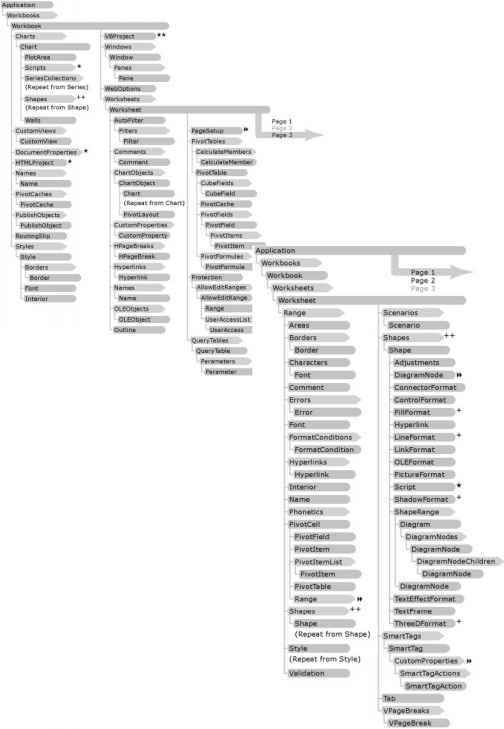 To make it easy to understand the Microsoft Excel object hierarchy, the Visual Basic online help offers a diagram of the object model, as shown in the following figures. Notice that the Application object is positioned at the very top of the diagram. 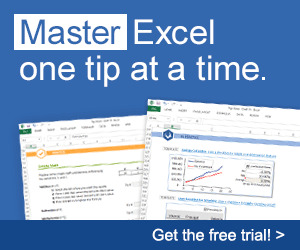 The Application object represents Microsoft Excel itself. Other Excel objects are located at lower levels. 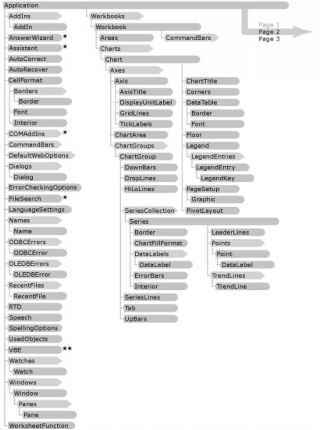 Using the Microsoft Excel object diagrams, find the paths to other objects, such as Window, Comment, AutoFilter, or ChartArea. Analyzing the object model is a great way to learn about Excel objects. The time you spend here will pay big dividends later when you start writing VBA procedures from scratch. Often, you will be required to specify the exact name of the object that is to be referenced. The above instruction should be written on one line and read from right to left as follows: Clear the contents of cell A4, which is part of a range located in a worksheet named Sheetl contained in a workbook named Chap02.xls, which in turn is a part of the Excel application. Notice the letter "s" at the end of the collection names: Workbooks and Worksheets. All references to the names of workbooks, worksheets, or cells must be enclosed in quotation marks. To locate Microsoft Excel object diagrams, choose Help | Microsoft Excel Help in the Microsoft Excel application window. On the Contents tab, click Programming Information | Microsoft Excel Visual Basic Reference | Microsoft Excel Object Model. In addition to Microsoft Excel objects, you can use the Microsoft Office, Microsoft forms, and DAO and ADO object models. Objects that belong to these libraries can be used in Excel, as well as in other applications that are members of the Microsoft Office family of products. See Chapter 15 for examples of using DAO and ADO object models in accessing the Microsoft Access databases from Excel.